The region known in the late 19th century as the Mussel Slough country was mostly in what was then Tulare County, California, with a small portion in what was then Fresno County (later the entire area became part of Kings County after the latter was formed in 1893). The Mussel Slough country took its name from a slough which went from the Kings River to Tulare Lake. This area had remained unsettled as it was a broad, dry plain suitable only for cattle ranching. However, in 1866 Congress authorized the railroad companies to build a line through the area, granting them the title to the odd-numbered sections of land (numbered lots of 640 acres (3 km2) each were created), totaling about 25,000 acres (101 km2) worth. The even-numbered sections were given to homesteaders by the government and were not subject to the events which followed. Given SP's history of encouraging settlement and development along its lines, land prices were expected to appreciate considerably. Settlers, who had spent a great deal of money and time in building their houses and farms, had begun to file for homesteads in the area on the railroad lands starting in 1869, in anticipation of the completion of the line. In 1872, the Central Pacific Railroad completed work to Goshen from the north and the Southern Pacific was to construct the southern portion (although not generally known by the public at the time, the two railroad systems were owned and operated by the same people although they were technically separate corporations). The SP's brochures had stated the price of the land would be "$2.50 per acre and upwards", leading many people to mistakenly believe that $2.50/acre was a set price. Furthermore, other brochures indicated that any improvements the settlers made to the land would not be counted when the prices were fixed. However, when the settlers attempted to acquire their land, the asking price was significantly greater than that, which SP attributed to rising property values because of the laying of the railroad, although many settlers believed it was due to their own improvements such as irrigation, housing, fences, and barns. Settlers protested against the railroads, but to no avail. A bill in the United States Congress that would have fixed the price at $2.50/acre failed to pass. The Southern Pacific then filed and won a lawsuit in 1878 against the settlers, amidst allegations of court bias (former California Governor Leland Stanford was also president of SP). Besides the 1874 Supreme Court ruling, a critical moment came on December 15, 1879, when Judge Lorenzo Sawyer (who owned shares of the SP) of the Ninth Circuit Court ruled in Orton, 32 F. 457 (C.C.D. Cal. 1879), that the federal government controlled the railroad land grants, and more importantly, the state could not control ultra vires acts of corporations. Given the legal system's affirmation of its position, the SP began to forcibly remove some of the settlers. Their agents would attempt to serve eviction notices, but often would not find anyone at home, as homeowners knew they were coming. In these cases, the agents then tried removing the furniture from the homes, but the Settler's League would just put the furniture back after the agents' departure. Finally, it escalated to the point where the agents would then disassemble the houses, but again, volunteers would just put them right back together. The settlers were not above their own brand of justice, either. People who had purchased land from those forced to sell would be harassed by locals, and in one case one farmer who had aligned with the SP had his house burned down. Those supporting the railroads tended to be wealthier than the others, deriding the Settler's League as "a set of demagogues" who were "very anxious to get something for nothing." Although the settlers received the benefit of public opinion, politically and legally every decision was going the way of the railroad. In March 1880, Stanford himself attempted a reconciliation by appearing in Hanford and meeting with the Settler's League in an attempt to find some sort of compromise. 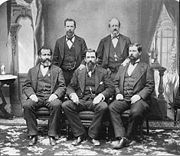 On May 11, 1880, a picnic was being held in Hanford which was to feature a speech by pro-settler former California Supreme Court Justice David S. Terry (who was actually unable to appear), when word reached the picnickers that four "railroad men" (A U.S. Marshal, an SP land appraiser, and two locals) were actively evicting settlers on railroad lands, and a group of about twenty people left to confront them (the historical marker indicates that the two local men were Deputy U.S. Marshals, which was not in fact the case). However, the rumors were only partially true; in addition to serving eviction notices, the group was also purchasing land (and any improvements) from settlers who had refused to pay SP's asking price. This act was seen as a betrayal of Stanford's visit a mere two months earlier. The parties met at the homestead of Henry D. Brewer three miles (4.8 km) north of Grangeville (which is near Hanford), the marshal's group having just been at Braden's house. Later testimony from uninvolved parties indicated that the party of settlers were lightly armed and had every intention of persuading the railroad party to delay their actions until a pending court case could be resolved. However, there was bad blood between Crow and Harris, and Hartt had previously threatened to kill any "sandlappers" (a derisive term for homesteaders, equivalent to the modern day "redneck"), and an argument broke out between them. Harris and Hartt simultaneously opened fire at each other. Crow, a skilled marksman who was armed with a shotgun, singlehandedly killed or wounded most of the settlers' party. After the initial exchange of gunfire ended, Crow fled the scene, but was shot in the back about 1.5 mi (2.4 km) away by an unknown assailant before he could reach safety. Poole and Clark did not participate in the battle and left immediately after the incident, possibly defusing tensions enough to avoid further bloodshed. Afterwards, seventeen people were indicted by a federal grand jury and five were found guilty of willfully interfering with a marshal in performance of his duties (Braden, Patterson, Pryor, Purcell, and John J. Doyle, a leader in the Settler's League). They were convicted in federal court (with Judge Sawyer presiding) and sentenced to eight months in prison and fined $300 each. Their time spent in imprisonment was hardly difficult. Three of the men's wives were allowed to live with them, and Susan Curtis, daughter of one of the jailers, fell in love with and later married Braden. Upon their release in September 1881, they were greeted by a joyous crowd of 3,000 in Hanford. Such was the anti-railroad sentiment that the five were looked upon as heroes across California, and those killed were considered martyrs who had given their lives for a cause. Nevertheless, the affair brought such a shock that people were sobered. The legal battle had been lost and the railroad had won. The only concession SP made was to reduce the land price slightly. In the end, most people simply stayed where they were and purchased the land. 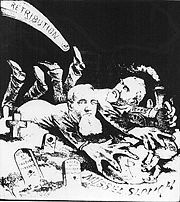 "The Retribution Comet" — Editorial cartoon published in The Wasp, July 8, 1881, depicting a comet with a skull about to strike railroad tycoons Leland Stanford and Collis Potter Huntington, shown robbing the graves of the Mussel Slough victims. The Mussel Slough affair was seized upon by newspaper editors as well as a number of popular writers soon after the tragic shootout, as an example of corporate greed and the abuses of freewheeling market capitalism at the turn of the century. Muckraking novels such as W. C. Morrow's Blood-Money (1882) and Charles Cyril Post's Driven from Sea to Sea; or, Just A' Campin' (1884) exaggerate the fault of the railroad for the events as they unfolded in San Joaquin and romanticize the ranchers according to a Jeffersonian agrarian ideal. Ambrose Bierce attempted to lionize Crow, calling him "this bravest of Americans." Later novels depicting the affair, such as the philosopher Josiah Royce's The Feud of Oakfield Creek (1887) and naturalist Frank Norris' The Octopus (1901) are slightly less hagiographic in their portrayals of the Mussel Slough ranchers, but nevertheless give a fairly one-sided, anti-railroad view of the Mussel Slough affair. Richard Orsi's history of the Southern Pacific, Sunset Limited, includes a chapter outlining some common misconceptions about the Mussel Slough affair which Orsi suggests have been perpetuated through the mythic retellings of Morrow, Post, Royce, and Norris, among others. The significance of the Mussel Slough myth in the history of California and the Southern Pacific Railroad is evident from a quote by Theodore Roosevelt, who as president focused considerable time and energy in redressing the wrongs and abuses of corporate monopolies throughout the U.S. After reading Norris' The Octopus, Roosevelt stated he was "inclined to think [...] that conditions were worse in California than elsewhere." These mythic narratives about Mussel Slough helped bolster public anti-railroad sentiments, and encouraged continued rebellion among homesteaders, squatters and poachers against railroad land agents, who "came to accept squatters as an ordinary, if disagreeable, part of the land business". Despite the nationwide attention the incident received, the Mussel Slough Tragedy is not remembered much today as well as later gunfights such as the gunfight at the O.K. Corral. Richard Maxwell Brown argues in No Duty to Retreat that the Mussel Slough shootout did not fit the mold of the gunfight/hero myth, which usually ignores such factors as ideology, and social and economic conflict, thus not implanting it in the lore of the American Old West. Six victims of the shooting were carried to the porch of the Brewer house, which was shaded by a tall oak tree. The tree became famously known as the Tragedy Oak. It blew down in a storm in the early 1990s. A piece of the tree was saved as a memorial and is on display at a nearby school (Pioneer Elementary School in Hanford,CA).